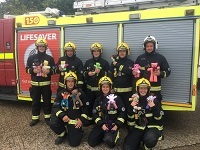 Hillingdon firefighters have recruited a specialist crew of trauma teddies to help comfort young children at house fires, road traffic accidents and other emergency incidents. A 450-strong batch of Trauma Teddies will ride on board fire engines alongside firefighters and will be handed out to children involved in upsetting and traumatic situations. The bears have been knitted by members of the Women’s Institute and their friends and family especially for London Fire Brigade as part of the worldwide Trauma Teddies initiative. The cuddly crews first job will be to take part in Hillingdon fire station’s open day on August 10 at which has been organised to celebrate the 150th anniversary of London Fire Brigade. The scheme is being spearheaded by Borough Commander Richard Claydon and will initially run for three months to test its success and usage. Borough commander Richard Claydon said: “We feel privileged that Hillingdon is the first borough within the London Fire Brigade to use this scheme and we hope it will be a great success. “This is a fantastic opportunity to work in partnership with the Women’s Institute to try to lessen the impact of the trauma experienced by children at emergency incidents. “All to often when we attend emergency incidents, we see children who are upset and who cannot understand what is happening and why we are there. “We understand how upsetting and scary these experiences can be and we will now be able offer some small comfort in the way of a teddy. Each fire engine which serves the Hillingdon borough will carry four bears at any one time and crews will gift them to children who are caught up in a range of incidents including road traffic collisions, house fires or simply being locked in a bathroom. The bears, which will be kept clean by being stored in zip lock bags inside the fire engine’s cab, have been specially designed with different patterns for boys and girls. If deemed successful, the scheme will be rolled out across the north west London area within several months, with a view of taking it Brigade-wide.